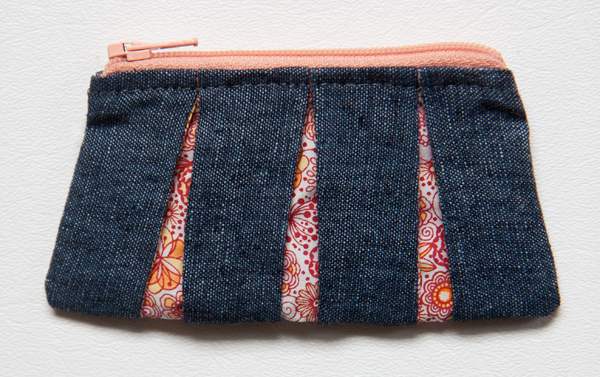 For this week’s zipper pouch, I decided I wanted to try some peek-a-boo pleats. I can’t say I’m pleased at all with the results, but because I left making the pouch until the last day of the week I don’t have time to remake it today. So this will be my project next week, too. I am determined to make it right! I used a navy linen on the outside, and the peek-a-boo pleats and lining are from Robert Kaufman’s London Calling lawn. I didn’t use any interfacing as I didn’t want the pleats to be strangely stiff. For the top of the pleats I folded the linen to meet at the center of the lawn strips, and for the bottom of the pleats I tucked the lawn under about 1/8″. Outer pieces: Front and back panels pieced together with 1.5″ x 3″ strips, to make 7.5″ w x 3″ h panels before folding. After folding, the top was approximately 4.5″ wide, and the bottom was approximately 5.5″ wide. I like this pouch! 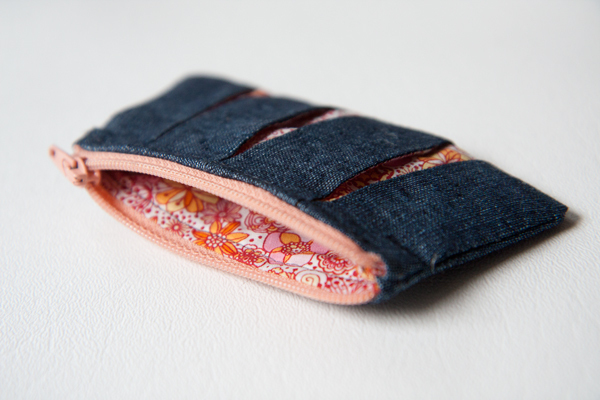 I dont think it looks like an awkward shape…but i am intrigued to go see how you modified it in your next week’s poat! I have ALWAYS loved a peekaboo pleat, but never done one. Yself. In fact, i just sewed a beds kirt with pleats, and should have peedaboo’d anothe fabric in there, but i chickened out!!!! Mainly bcuz i didnt have a fabric on hand that could be a good match to whatever bedding i use, and i am on a fabric buying hiatus! D LOVE THIS 52 ZIPPER POUCH SERIES!!! Your designs have all been genius! Thanks for sharing with us!